Join co-hosts Save-at-Home-Mom Christa Clips and Common Cents Mom Hollie Pollard as we chat about how to Eat Better for Less at this week’s #CDNmoney twitter chat! Cash back rebates, price-matching, growing vegetables from scraps, and even climbing a ladder each fall are 4 of my favourite ways to save on fresh produce. 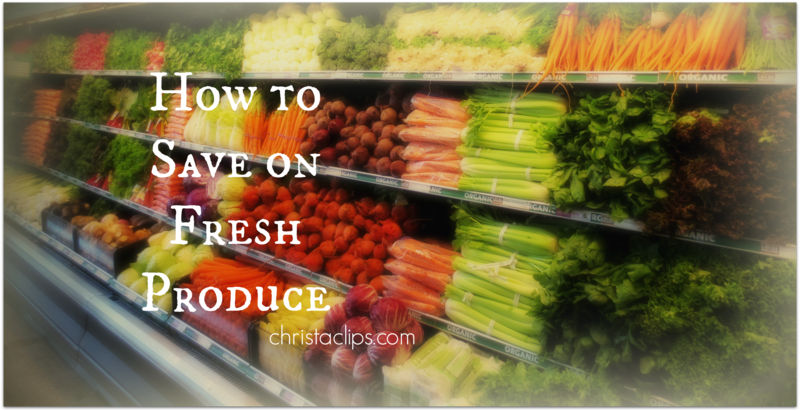 Here’s my blog post, (not so creatively titled) 4 Ways to Save on Fresh Produce! Hollie shares her Tips for Eating Healthy on a Budget in her blog post on her CommonCentsMom blog! Christa Clips: Save-at-Home-Mom shares tips for saving money on fresh fruit and vegetables at the grocery store. The price of fresh fruit and vegetables can be shockingly high at times and this has given rise to the notion that feeding our families whole foods is more expensive than processed and prepared foods. There are coupons for fresh produce in Canada every now and then: I redeemed the last of my strawberry coupons this week, but they’re too few and far between to be relied upon for any consistent savings. And while growing vegetables from scraps has been a lot of fun for the kids to watch, we’d likely develop scurvy if we relied solely the meager crop yield from our frugal garden! Trying to stay within budget while providing 2 servings of fresh fruit in each of our children’s lunchboxes plus a 3rd and often 4th serving after school and/or as dinnertime dessert is hands down the biggest challenge when it comes to grocery shopping for me. It takes a little extra time, but I try to take these 4 extra steps when grocery shopping to try to save at the grocery store. Christa Clips uses mobile apps to find the best price for produce and price-matches with her mobile phone. 1. Price Match the lowest flyer price on fruits and vegetables. 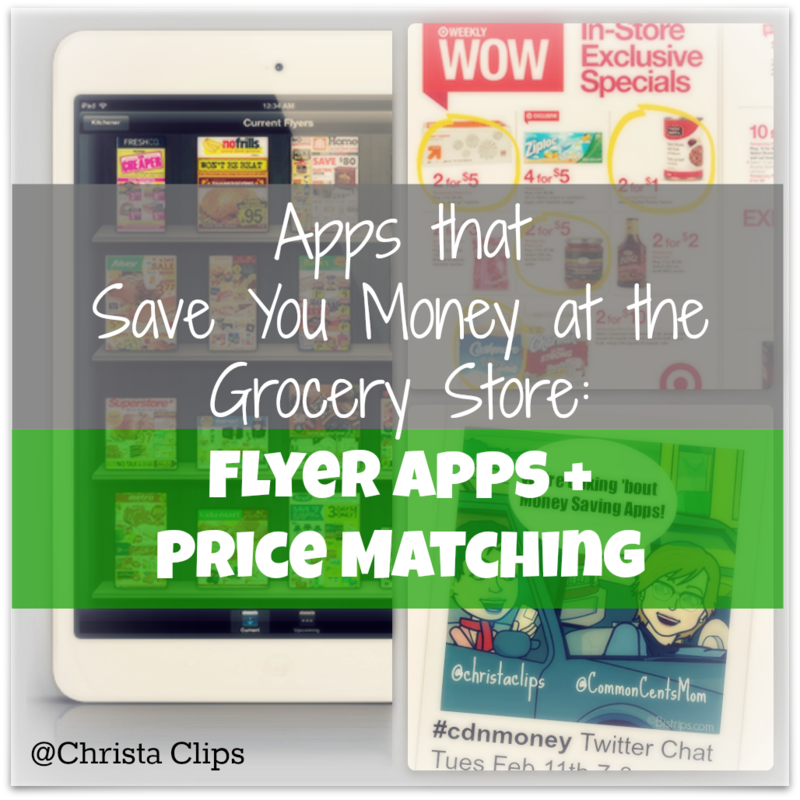 With the advent of so many Apps that Save You Time & Money at the Grocery Store, saving on your grocery bill has become so slick and effortless. By finding the lowest price for whichever fruits and vegetables are on sale on any given week, I use my mobile phone or iPad to “flash at the cash” and price-match all of my produce. Yes! We can price-match fruit and vegetables at the grocery store! My favourite flyer app has got to be Flipp – I can search by item, clip the best price to my shopping list, and flash the flyer on my phone to make sure I’m paying the lowest possible price on an item with just a few simple taps on my phone screen. 2. Claim Cash Back Rebates. Checkout51 and SnapSaves are offering more and more cash back rebate offers for fresh produce these days. Download the apps to your mobile device and/or your home computer and upload your grocery store receipts to earn money. The fresh produce offers seem to run out early so be to apply for the rebates as early as possible when they’re offered. 3. Buy early, mid and late in the sale week. We have a small kitchen and a small fridge. We don’t have room for 4 melons on the counter,for example, nor will we through it all before it over-ripens and/or we’re just plain sick of it! I try, therefore, to buy just enough for 1 or 2 servings of each fruit that is on sale (or that I’m price-matching) when the new flyer week starts (Thursday in Quebec, Friday in Ontario – I shop in both provinces). I’ll pop in again early in the week to buy a 2nd round of servings and then one last visit on the last day of the flyer sale. On that last trip, I sometimes get 2 servings of the fruit if I’m able to get some that are ready to eat now and some that will ripen in a few days’ time. It seems simple, but keeping to this rhythm really helps to space out our servings (avoiding strawberry overdose!) and keeps our waste to a minimum. Tip: don’t hesitate to ask your produce manager which days certain fruits or vegetables are due to arrive at the store: it’s my experience that they”re usually able to share the details right off the top of their head and are more than happy to do so. 4. Buy in Season. 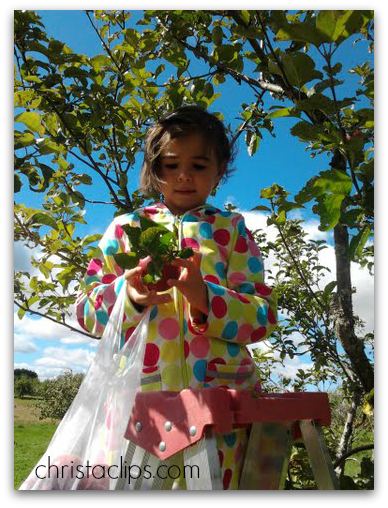 Most fruit comes down in price at one time or another during the calendar year. We enjoyed our easy peel clementines all winter, for example, and will just have to wait until they come down in price again before we start buying them on a regular basis again. Watermelons are due to come down any week now (yay!) and it won’t be long before we’re into autumn blueberries and apples on sale. If there are not enough sale prices in any given week to provide a diversity in fruits, sure, I’ll splurge on something full price (eek!) … I’m not going to make my family eat strawberries, grapes and bananas every day of the week. More often than not though, there are at least 5 or 6 different fruits on sale and we are able to make it through without any overdoses! Tip: picking your own, or buying directly from the fruit producer in season at farmers markets is usually the least expensive option. Flying to the tropics to buy fresh bananas, however, makes slightly less economic sense pointed out our 8 year old daughter. Smarty pants! Some things that I do NOT rely on to save money on fresh fruits and vegetables. Clearance Rack. I’ve just not had luck when buying fruit or vegetables on the clearance rack (usually 50% OFF) which are marked down because they are “ready-to-eat” aka past their peak in terms of ripeness and shelf life. That being said, if I were going to be making a big batch of sauce or soup it would likely be just fine; I just never seem to find the right fruits/veggies for my needs on the rack. I supsect my friend Maranda of Propel Wellness is beating me to the good stuff … this town just ain’t big enough for two savvy shoppers! Check out Maranda’s tips in her blog post Never Throw Out a Banana Again. Overage. Some stores (e.g. Walmart) will credit your transaction with the left-over value of any coupons for which the price of the item was less than the coupon’s worth. There are often items which turn out to be “money makers” and couponers who have multiple copies of coupons are able to earn enough money to offset the cost items which rarely have coupons: namely their produce and meat. I’m on the fence about how I feel about this practice when it’s conducted on “extreme” scale and can’t personally justify the savings at the expense of other shoppers who find an empty shelf when they’re hoping to redeem a coupon on a sale item that week. Even though there are not often Canadian coupons for fresh produce, by sticking to the 4 savings methods above, I consistently pay the lowest advertised price each week and keep our family eating a variety of fresh fruit and vegetables. 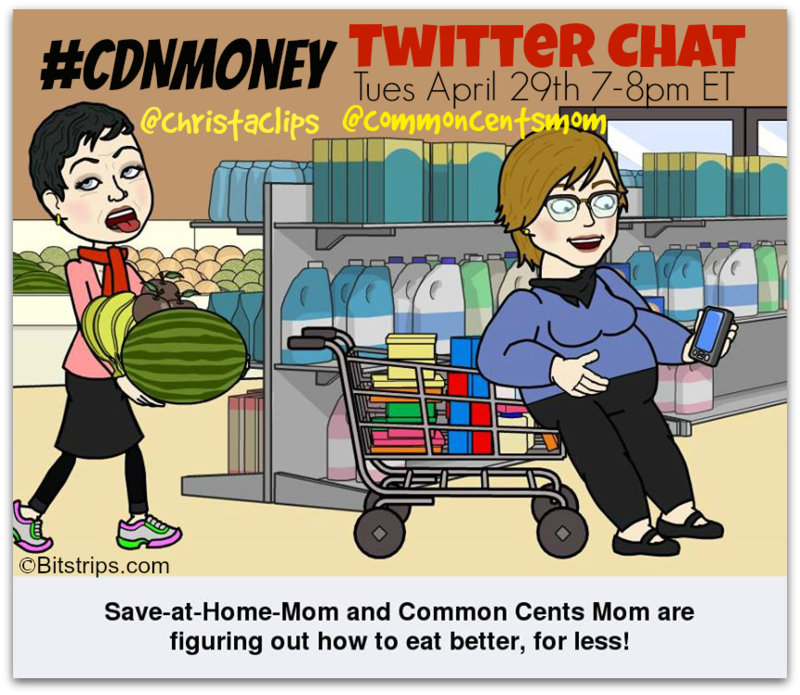 #CDNmoney chat co-hosts @christaclips and @commoncentsmom are hosting a twitter chat about How to Eat Better, for LESS for this week’s #CDNmoney chat. Join us! How do you save on fresh produce? Drop a line in the comments below, and join Common Cents Mom and I for this week’s #CDNmoney twitter chat when we talk about Eating Healthy for Less! 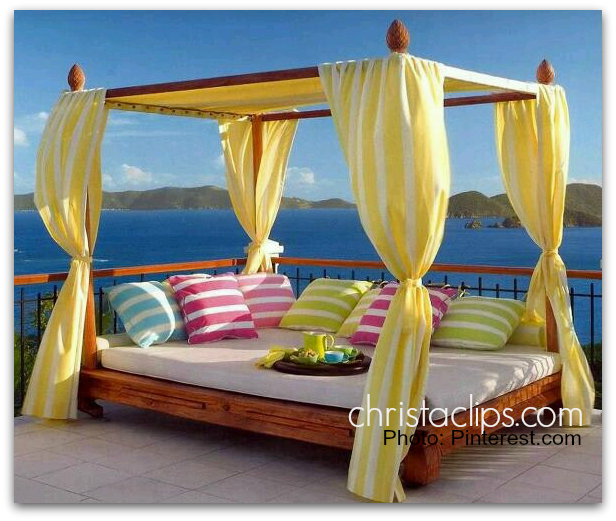 I think I kinda have to have this Poolside Bali Bed! Last night’s #UsedParty on Twitter with @UsedEverywhere has me totally inspired to do some upcycling projects around the home. And while I know that we don’t actually NEED a poolside Bali Bed, I’m having a really hard time restraining my clutterbug DIY demon. I mean really, how often do you see one of THESE for sale? Dave is My Buddy With A Truck and has the BEST upcycling treasures at prices that are FAR to tempting for clutterbugs like me! 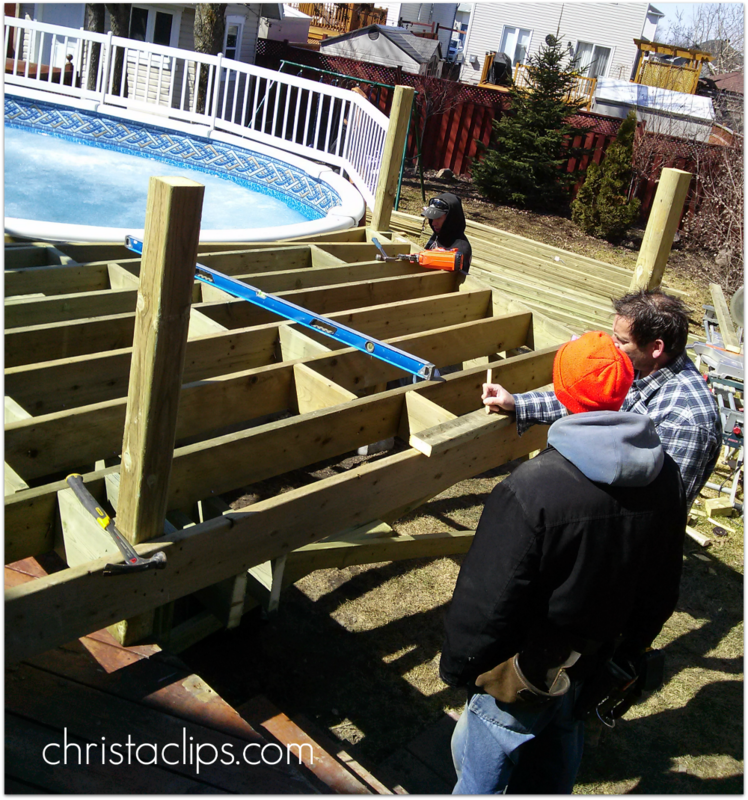 Our deck crew from FenceAll in Ottawa are clipping right along with our new sun deck! 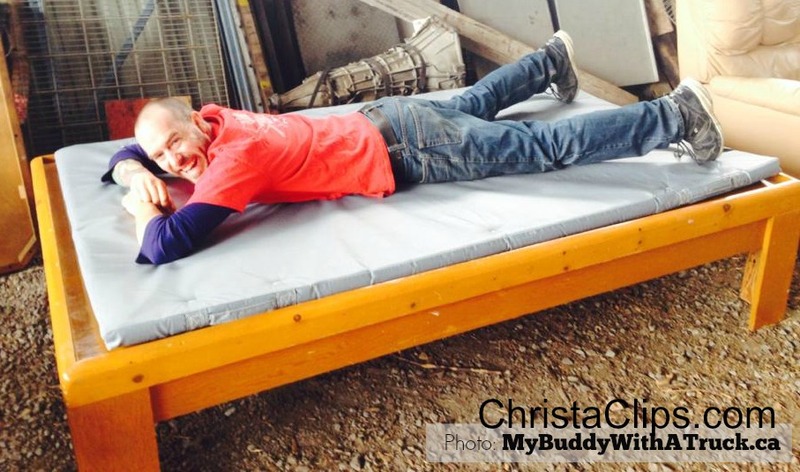 Christa Clips wants to take on this DIY Bali Bed Upcyle project! Adding a gazebo cover to the upcycled physio bed would make a budget friendly poolside Bali Bed! So I’ve stared another Pinterest board to let my Poolside Oasis DIY Ideas simmer for a bit (until I can convince Hubs that we kinda have to have a Poolside Bali Bed!). If we’re not connected on Pinterest yet, let’s get on that, k?! 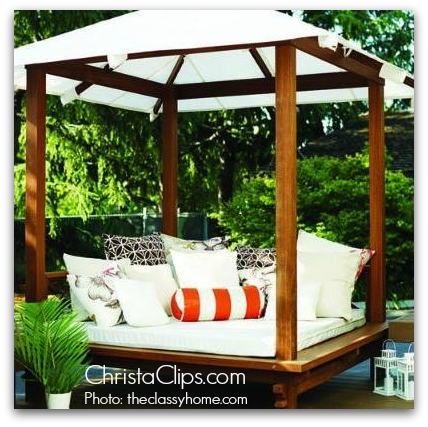 Connect with Christa Clips on Pinterest and send along any other Bali Bed ideas you stumble upon! Posted in Christa Clips, DIY and Upcycling!